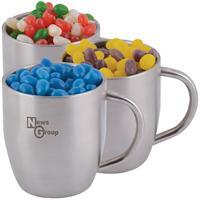 280 grams of Corporate Colour Mini Jelly Beans packed in Double Wall Stainless Steel Curved Mug. Your choice of jellybeans, choose from 9 great colours and flavours – Orange (Orange), Pink (Peach), White (Lychee), Red (Strawberry), Green (Apple), Yellow (Pineapple), Black (Grape), Purple (Grape), Blue (Blueberry). SKU:LL8645. Categories: Confectionery, Jelly Beans.